Msgr. Joeseph Prior leds the people in prayer at St. John the Evangelist where the procession ended. 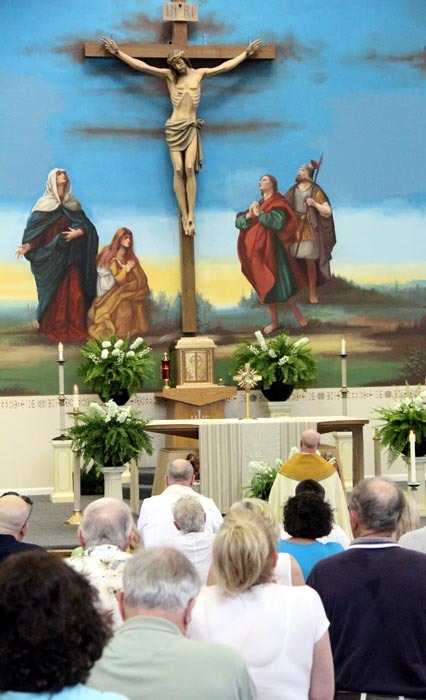 Archbishop Charles Chaput visited St. John the Evangelist Parish, Morrisville, on June 14 to celebrate the closing Mass for the parish’s golden anniversary. When I-95 was under construction during the mid-20th century it decimated a number of parishes in the river wards of Philadelphia, but further up in Bucks County, it caused a boom in the construction of new housing and new parishes. One of them was St. John the Evangelist, founded in Morrisville in 1964. For St. John’s it has been for the most part a good 50 years; blessed be the name of the Lord. 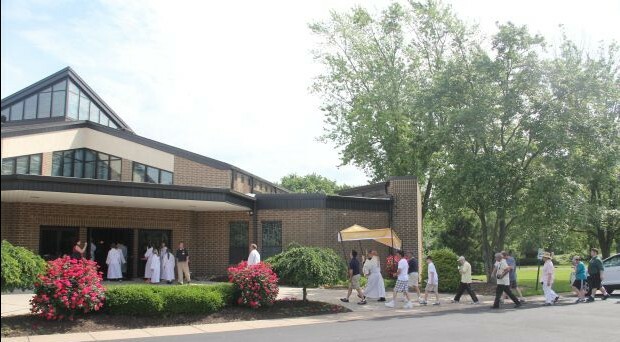 Father Joseph C. Belz, the founding pastor, initially utilized a renovated garage for his rectory and celebrated Masses at the Sherwood House, a restaurant-banquet facility in Falls Township. After a first location for a parish campus was deemed impractical, the present location at Big Oak and Makefield Roads was chosen and construction for a combination church/school building was begun. Although the building was only partially completed, the first Mass was held on Christmas Day, 1965. This is a relatively common practice for a good reason. Generally speaking church properties must be used in the course of the year in order to be nontaxable that year. Christmas is just about as late as you can get to fulfill the requirement. Msgr. Joseph Prior, pastor of St. John the Evangelist, blesses during benediction that end the procession at St. John the Evangelist Parish in Lower Makefield. By April 1966 the building was completed. The school, under the direction of Bernardine Franciscan Sisters, opened in September and Archbishop Krol dedicated the building in December. It would not be until 1982 that the present church was built. He credits the variety of ministries that have been instituted, as well as old ones that have continued. For example, a discipleship ministry conducted by Immaculate Heart Sister Mary Ellen Diehl, is really a continuation of the Disciples in Mission Program that was adopted by many parishes during the Millennium celebration but died out in most other places. After a period of some decline, momentum seems to be rebuilding with a new generation of young families moving into the parish again. “Two weeks ago we had baptisms for eight babies,” Deacon Hartmann said. Kathy Ross, a member of the parish pastoral council, points to the excellent youth program headed by Maria Parker, the Disabilities Outreach, the very active Knights of Columbus Council and most especially, the daily Mass, which is not only very well attended but also streamed on YouTube and can usually be accessed any time of day by computer via stjohnpa.org, the parish website. The Mass is usually celebrated by Msgr. Joseph Prior, St. John’s pastor. 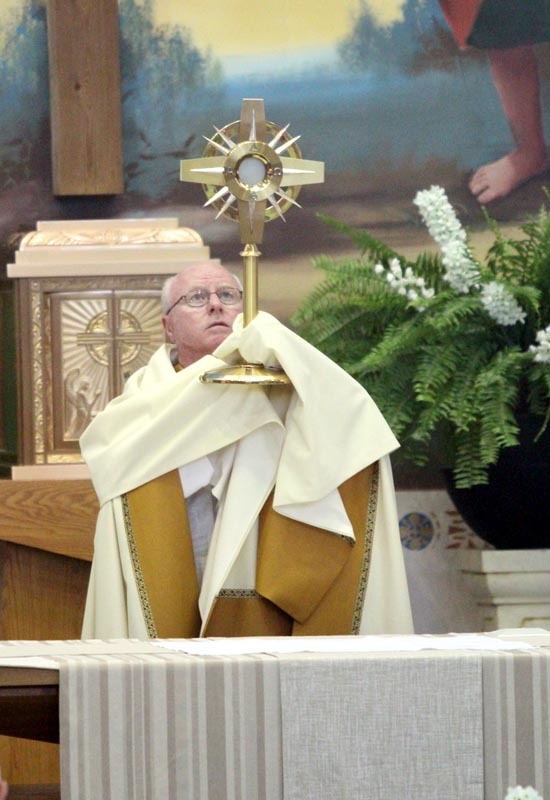 “He is a theological scholar and a lot of people come to our Mass just to hear him preach,” Ross said. Bridget O’Reilly has been a parishioner her entire life, which isn’t hard, because she’s 17. We live in an age when many young people are not attending church, but Bridget says many of her friends do, partly because it was instilled in them at home and school, but also, “We have a great youth program,” she said.